Kurt Bortsing, who previously worked for the Marine Bureau of Long Beach, is tasked with implementing city’s vision for new harbor department. NEWPORT BEACH — The city of Newport Beach, as it enters 2019, has a new harbormaster. Kurt Borsting, who previously worked in Long Beach, has taken the reins from Dennis Durgan, who had served as the first harbormaster since July 2017. The harbormaster position was created last year when Newport Beach city staff amended the city ordinance to create the harbor department. The harbor department’s operating budget is $1.1 million. Borsting started his new position on Monday, Dec. 10 and was given an introduction at the harbor commission meeting the following Wednesday. Borsting, who spoke at the meeting, said he had grown up in Long Beach and had also raised his family there. His most recent job was as the marine operations superintendent for Marine Bureau of Long Beach where he managed three municipal marinas. City staff worked with Bob Murray & Associates, a Sacramento-area recruiting agency, to fill the harbormaster position. The annual salary for the harbormaster falls between $98,016 and $147,000, according to the job listing for the position. There were other perks for the position including a $400 a month automobile allowance, a monthly smartphone, administrative leave for up to 80 hours per calendar year with permission from the city manager, a $50,000 life insurance policy paid for by the city and a monthly $1,725 cafeteria plan with medical, dental and vision insurance coverage. In a description of the ideal candidate, strong leadership skills, a proven track record and transparent communication with the general public, and excellent oral and written communication skills were noted to succeed in this position. The listing further stated: “The ideal candidate will be a flexible, level-headed individual who is approachable and capable of developing and maintaining a good rapport with staff, community members, and the general public,” emphasizing the newly developed harbor department’s focus on good service. Durgan had also applied for the permanent position, along with 42 other candidates, but was edged out by Borsting’s experience in a similar position. Harbor Commission member Paul Blank told The Log in an email he had been part of the interview process to hire the new harbormaster. Blank said in July 2018, after the harbor department was formalized, the city’s human resources department and recruiting agency began a nationwide search to find candidates. After detailed background checks and the negotiation period, Borsting emerged as the best fit for the position. Though Durgan had been part of the application process, he was not selected due to not meeting the minimum experience in managing a harbor. Durgan resigned in October, but offered up his expertise during the transition. However, current harbor commissioners still had glowing things to say concerning Durgan’s year as a temporary harbormaster. In a “Week in Review” newsletter sent from Leung on Nov. 30, she stated Durgan is in negotiation to help with Borsting’s transition. 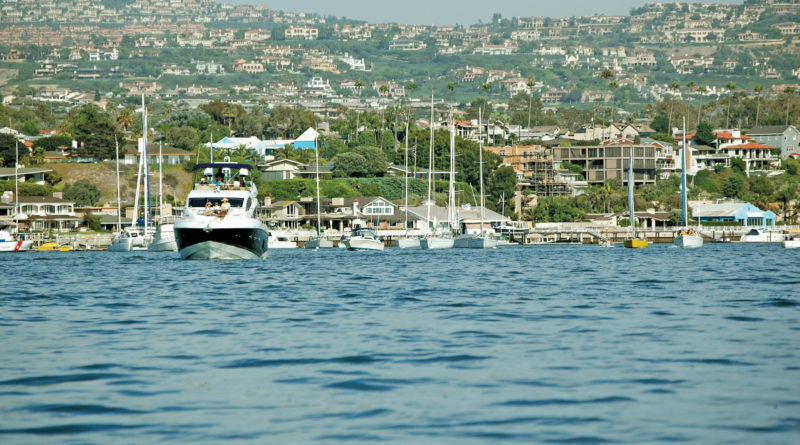 It will be important for the new Newport Beach harbor master to develop a comprehensive fire suppression plan for the private vessels at the 1200 moorings and anchorage areas in Newport Harbor. The current lack of an internal Newport Beach fire department resource to provide fire pumping, dewatering and access by State certified firefighters creates an enhanced risk to the public. Ad-hoc exterior fire attack services by the O.C. Sheriff’s Harbor Patrol, while well intentioned, do not provide the public using the recreational environment of Newport Harbor with adequate fire suppression capabilities needed to rescue persons trapped in an interior vessel compartment fire. Each vessel at a mooring or anchorage should be viewed as a residence sitting over a gasoline station floating in the water. The myriad of electrical systems, hazardous materials, confined spaces and volatile flammable and combustible fuels add to the seriousness of the challenge in firefighting efforts for land-based firefighters operating on the water. P. Matheis are you a member of NBFD? I can’t remember for sure, but I don’t think there has EVER been a life lost in Newport Harbor because the Harbor Patrol didn’t board a boat and rescue a victim during a fire. Please remind me if there was. The important question is about the level of training by whomever is tasked with the duty to address fire suppression on the water in Newport Harbor and long the Newport Beach coastline inside the three mile limit from mean high tide. This is the exclusive jurisdiction of the city of Newport Beach. Because of this fact in law I submit that it is important for the City to ensure that adequately trained and staffed fire suppression resources are deployed and fully prepared to respond in a timely fashion 24/7 so as to minimize the risk to the public who may have occasion to be on these waters. Orange County Sheriff’s deputies are outstanding law enforcement officers and probably fine vessel operators as well. However, they are not trained firefighters according to the standards established by the Office of the State Fire Marshal and State Fire Training. Further, the minimal fire suppression training received by the good men and women of the OCSD is not a program developed by firefighters qualified to design the curriculum needed for the rigors of interior structural firefighting. I am not a current member of the NBFD.